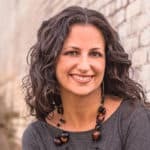 Nancie Vito is a transformational life coach, public health professional and certified health educator specializing in helping people go from functioning to flourishing. She works with creatives, aspiring entrepreneurs and other professionals who want to get unstuck, prevent burnout and take steps towards what they really want in life. She holds a master’s degree in public health with an emphasis on prevention and mental health and is in the process of obtaining a graduate degree in organizational psychology. Since starting her business Flourish in 2009, she has been mentioned or featured in online publications such as Huffington Post, MindBodyGreen and Marie Claire UK. Mindfulness has helped me be much less reactive and much more conscious of my behavior and how my behavior effects others. In general, much calmer. I love the whole concept. It just brings me back to center, it helps me become grounded. It's something I can do anywhere; on a plane, on a subway. In the middle of a workday I can take some conscious deep breaths and have a change within seconds.